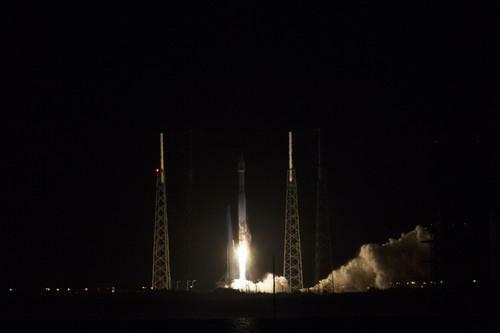 NASA's TDRS satellite launching on an Atlas V rocket on January 23, 2014. NASA's newest Tracking and Data Relay (TDRS) satellite, which will provide high data-rate communications to space craft, went into orbit Thursday night. TDRS-L (say: Tee-Driss) is the second satellite in a trio that will connect the International Space Station, Hubble Space Telescope and other satellites with NASA control centers on the ground. To date, 11 TDRS satellites have been put into orbit and eight remain operational. TDRS-L joins TDRS-K, an identical satellite that launched last year. The last of the trio, TDRS-M, is slated to go into orbit in 2015. To see the rocket carrying TDRS-L lift off, watch a video on YouTube. Before the TDRS fleet became operational in 1983, satellites didn't have constant contact with the ground. In the 1970s satellites orbiting the Earth relied on NASA's network of ground stations to provide a communications network. As the satellite passed over one of the ground stations it would exchange information. But the small network could only cover just 15 percent of the satellite's orbit, according to NASA. The TDRS network functions by relaying communications from satellites and space craft to one of two ground stations, either White Sands Complex in New Mexico or the Guam Remote Ground Terminal. If the signals are sent to Guam, then they're relayed to White Sands, which will pass all communications to the various mission operations centers that may be in charge of the satellites or space craft. Boeing Space and Intelligence Systems, the manufacturer of TDRS-L, has started a three-month "checkout" where it will conduct a battery of tests before putting the satellite into service. TDRS-L went into space aboard a United Launch Alliance Atlas V rocket from Cape Canaveral Air Force Station in Florida at 9:33 p.m. EST.